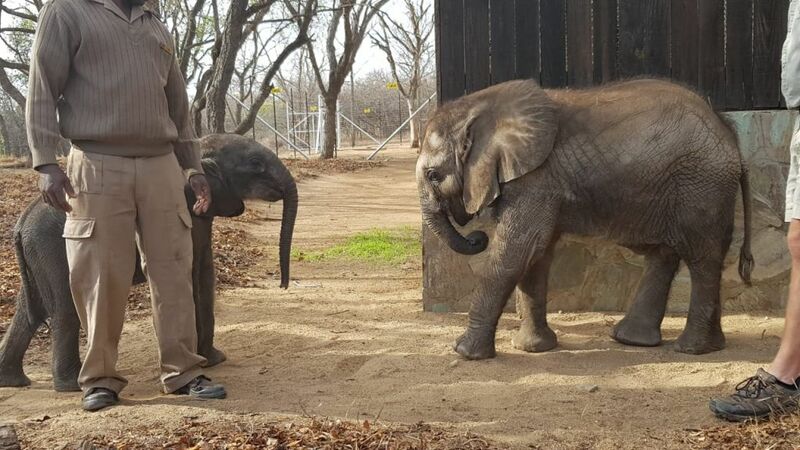 Mopane has a new friend – HESC provides sanctuary to a second orphaned elephant. 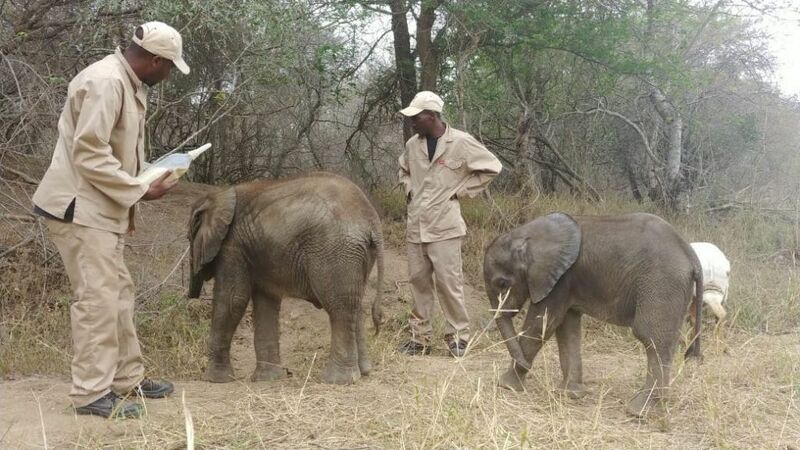 A “Rae” of serendipity as another elephant calf joins Mopane at HESC. 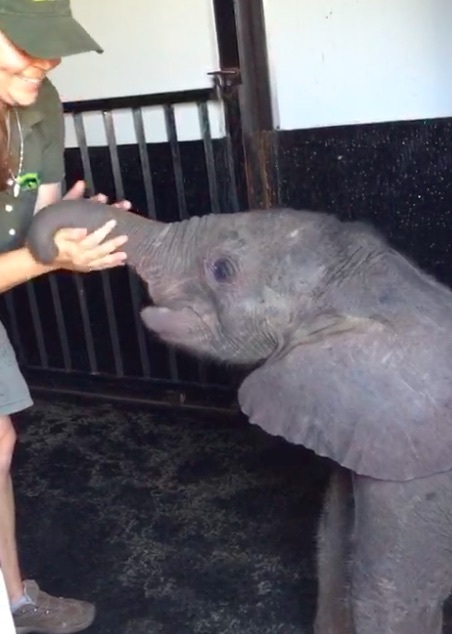 Two months ago, another elephant calf arrived at HESC. 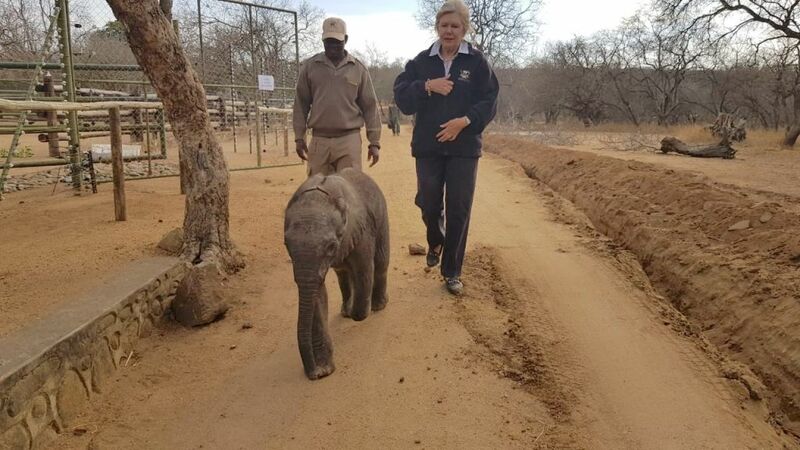 We were approached to assist with the baby elephant that had been found wandering on its own, in the Imfolozi Game Reserve in KwaZulu Natal, South Africa. It has been so incredibly hard not sharing this news for the past two months, but I was unable to do so until such time we had the correct paperwork in place, which turned out to be a bigger and longer challenge than expected. I am so relieved that I am finally able to share this important news with our supporters and followers. On Friday 19 October, in the late hours of the afternoon, I got a call from Megan Lategan from Zululand Rhino Orphanage, asking for assistance from HESC. Wildlife Veterinarian, Dr Dave Cooper had been called out to the Imfolozi Game Reserve, by the Ezemvelo Anti-poaching unit. They had found a very young elephant calf wandering on its own, with no herd in sight. The baby elephant was found on a road close to the main entrance to the Hluhluwe-Imfolozi Park, and there were no breeding herds in the area. The female calf, estimated to be two months old, was mildly dehydrated and appeared to be otherwise unharmed. Dr. Cooper agreed that Megan should contact us at HESC, both aware of our experience with elephants over the years. 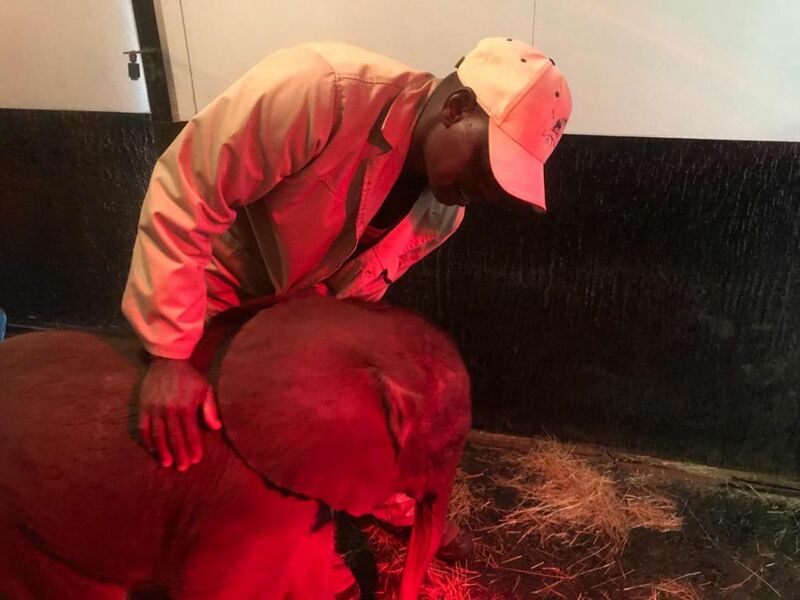 There are facilities in KwaZulu Natal province, that care for orphaned rhino and other wildlife, however they lack the experience and expertise to care for orphaned elephants. Without hesitation, we agreed to help the baby elephant. 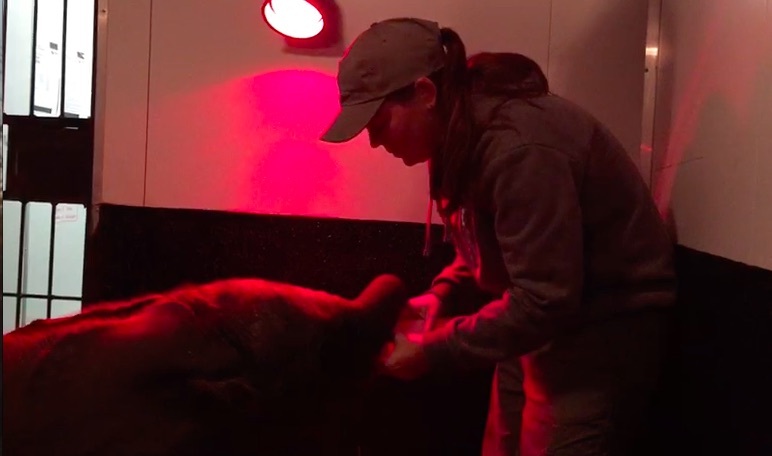 However, I knew we had to move fast, due to the delicate nature of an elephant calf’s health and well-being, and just how quickly their condition can change. 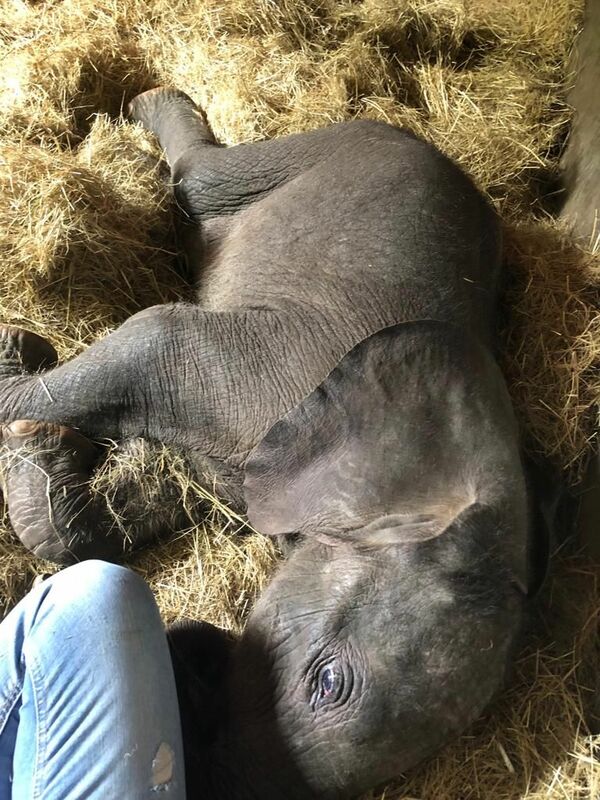 The local authorities, which included the Limpopo Department of Economic Development, Environment and Tourism (LEDET) were informed immediately of the impending translocation and it was decided that the elephant calf was to be transported by road to Hoedspruit the following day. This was confirmed on the understanding that any permit issues would be sorted out after the weekend, as it was already late into that Friday afternoon. (This is a legal requirement as we were moving the elephant calf from one province of South Africa, KwaZulu Natal, to another, Limpopo, where HESC is based.) However that process took somewhat longer than we had hoped for, hence our delay in releasing this news. 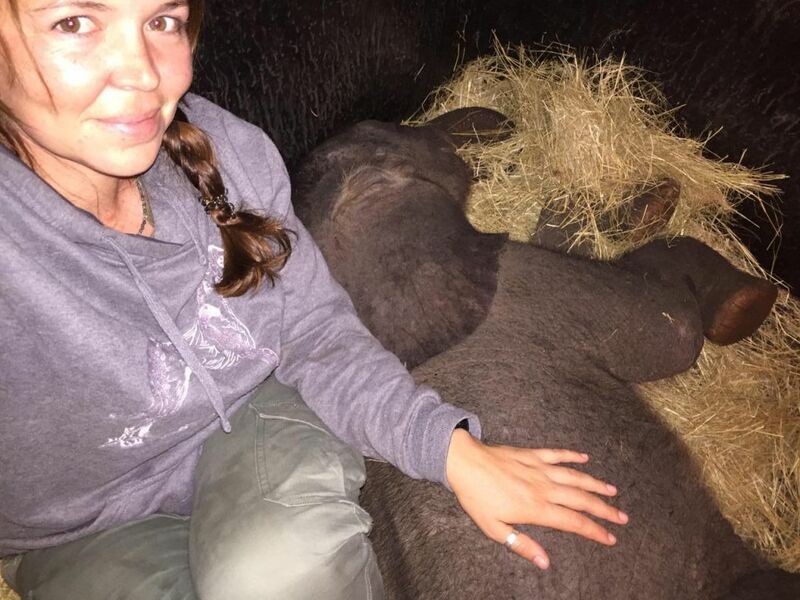 After some rapid brainstorming, knowing time was of the essence, it was decided that we would send a team from HESC to Megan at the Zululand Rhino Orphanage, who would care for the little elephant overnight. I guided Megan with step by step guidance in how to deal with and stabilize the orphaned elephant. They set out to try get some of the essential products needed for milk formula for such a young elephant, but they were unable to locate them in their vicinity. Due to this, I decided that it was best to not give her the milk formula without the correct ingredients, as the risk was too high that she could get an upset stomach, which could result in diarrhea, and would most probably cause her death. Instead, I asked that Megan only give her rehydrate through the evening, and stay with her throughout the night, updating me on her condition. Fortunately, the little elephant had a good night, in the excellent care of Megan and her team, and was looking strong the next morning. We sent Linri Janse van Rensburg, (head curator at HESC), Juan Ferreira (Camp Jabulani ecologist) and Joshua Dube (senior elephant carer), to fetch the calf, together with the crucial milk formula for the baby elephant, as it was essential to the survival of the calf that she drank the milk formula soon. They were glad to find the baby elephant in good health when they arrived, she drank her milk immediately, which was excellent news. Megan and her team did a fantastic job. It was not long until they were back on the road for the journey back to HESC. I met them en-route to check on the calf, as I had been in Pretoria at the time of the news. I had the company of Hermien Roevert during my drive, who has spent a lot of time documenting the activities at HESC over the past few months. We arrived at HESC at 9pm. The rest of the team on the ground had ample time to prepare for the baby elephants arrival. 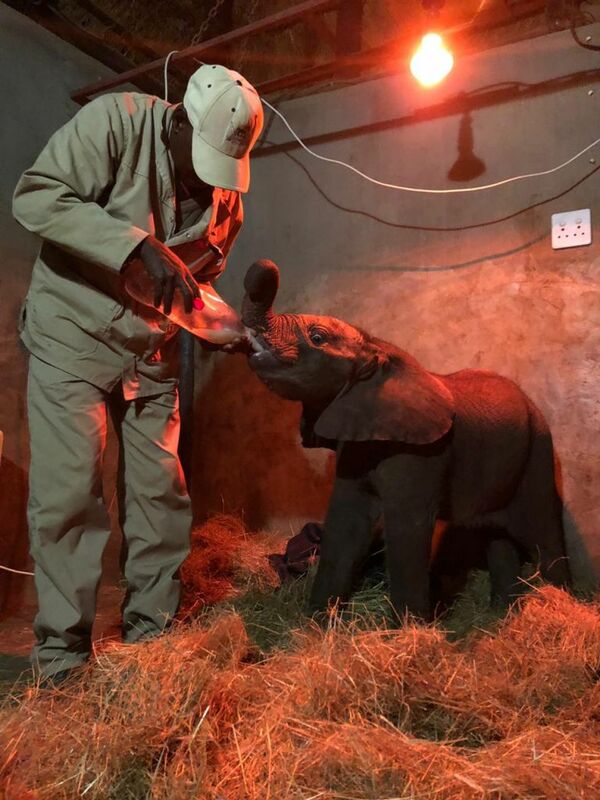 The boma was heated and cosy, and her dedicated elephant carer for that evening was ready with the milk bottles prepared for the two hourly shifts. We gave her time to settle in gently, and get used to all the new sounds and smells, and she settled easily. I have to mention that all the while, we had actually been expecting a bull, however, once we were all settled, and could take a closer look, we confirmed that she was indeed a female. 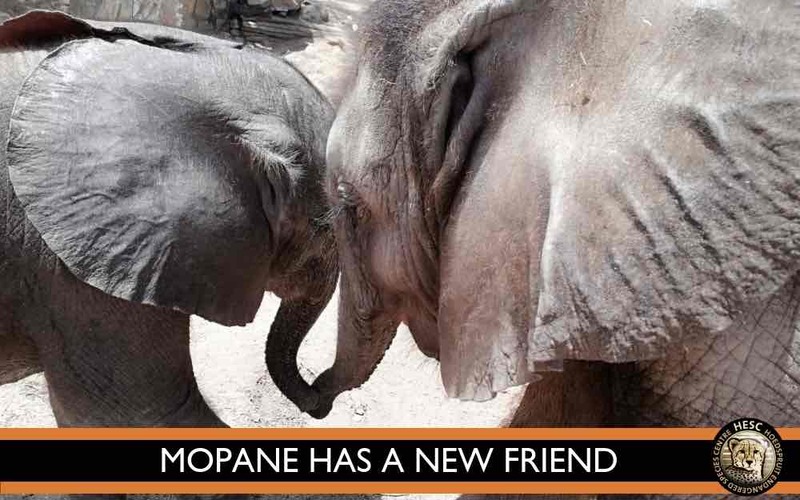 We were naturally anxious to introduce her to Mopane, as many will recall, Mopane was going through a rough patch during that period, and his health was not great. So, we hoped that the company of another elephant would help lift his spirits, but we had to let her settle in overnight first, and introduced them the next day. It was not long until we were all calling her “Raekie”, so that has now stuck, and it really suits her lovely little personality. At first sight of Raekie, Mopane became quite nervous and tried to hide behind Liverson, so Joshua left Raekie with my mom so he could moved closer towards Mopane. As he did that, both of them walked towards him, and he stroked their trunks for a while and talked to them softly to relax them both. They slowly started to explore each other with their trunks, touching and smelling one another. Raekie kept hiding behind Joshua, it was clear they had struck up a bond on the journey to HESC, and she felt she could trust him. Linri suggested that we give them a bottle of milk each at this stage, which they both enjoyed. Rae was just a bundle of energy, and certainly lifted Mopane’s spirits. 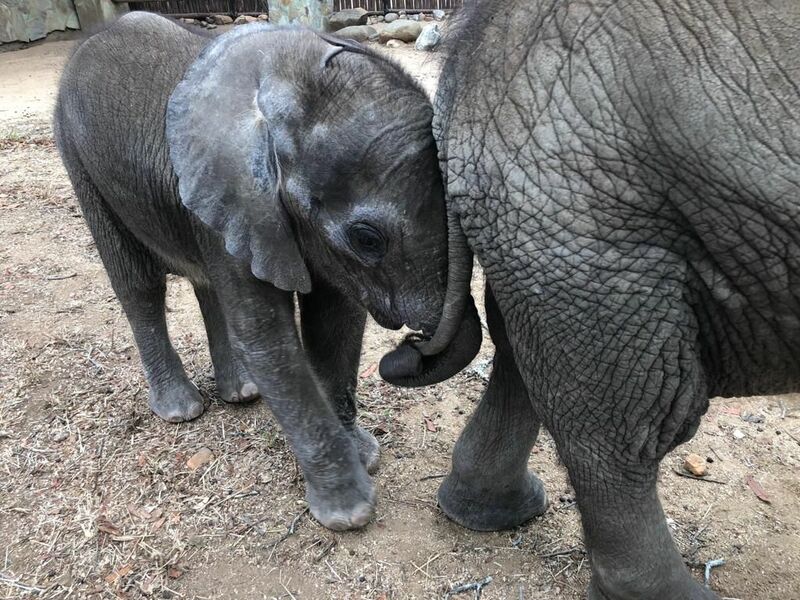 Whenever Mopane would lie down for a nap, little Rae would climb all over him to get him to play with her and go for walks, as she is very active. This has resulted in Mopane wanting to walk a lot more, and in turn, his energy has increased, and he started to drink better too. Mopane’s improvement is testament to the importance of young elephant orphans needing the company of other orphans, as their strong social bond clearly makes a huge difference to their wellbeing. We just wish we could have been more open about the events at the time, but as I mentioned, we were unable to, until now. 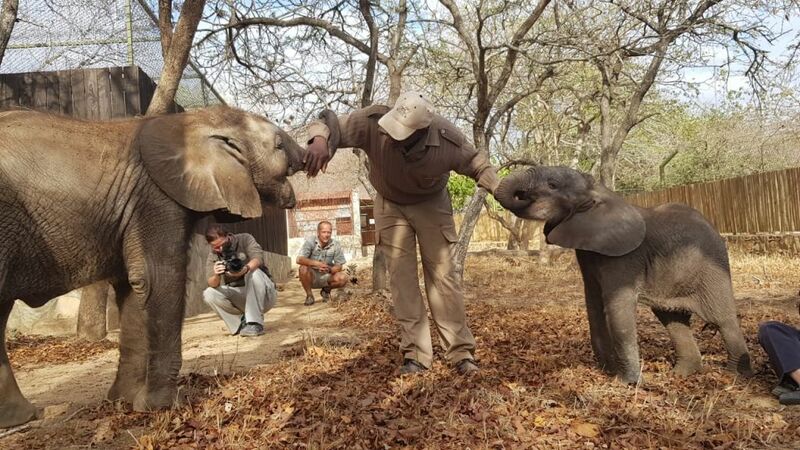 The “conservation stars” aligned themselves beautifully that day, for these two orphaned elephants, and now we have to ensure we give them the best second chance possible, at their new lives together. Thank you for everyone’s patience and understanding, and we look forward to sharing their journey with us, with you too. On a more serious note, we are in dire need of funding. This year has been a huge financial drain on us at HESC and sadly we are in a massive deficit, due to extensive veterinary costs, and the high costs of milk, and running of our facilities. We will be launching a Global Giving Fundraiser for the elephants in the coming days. However if you are in a position to donate now, we would be very grateful, and you can click HERE to do so. Adine Roode – Director at HESC. Raekie wound not have survived, had it not been the alert and speedy actions of the Ezemvelo Anti-poaching unit on that Friday afternoon. They stayed with Raekie to ensure she was kept safe until Dave Cooper arrived, who in turned, provided safe carriage and guidance in the urgent situation. 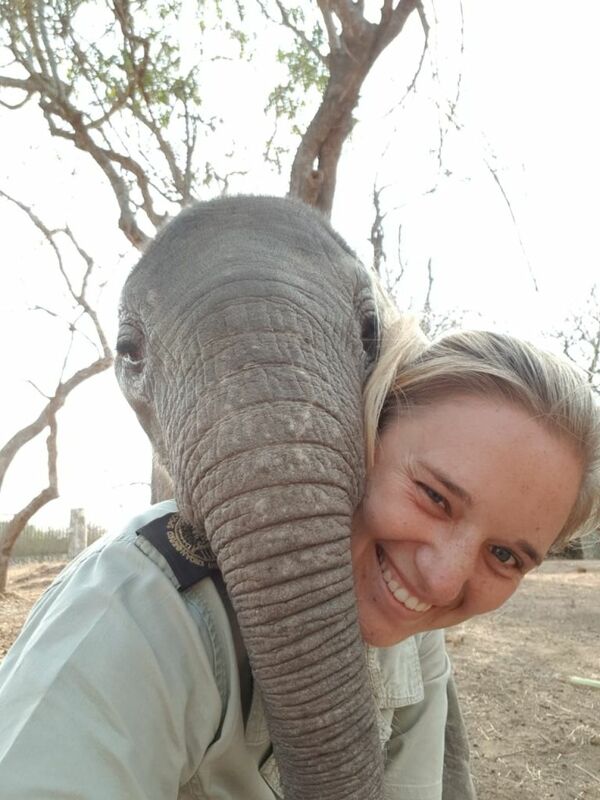 Thank you to Megan from Zululand Rhino Orphanage for her wonderful help with caring for Rae on the first night, which is always so crucial with baby elephants. We may have come #together4hinos on World RhinoDay, but this time we came #together4elephants. Megan has already been to HESC to visit Raekie again, and spend some time with her, as well as us, and we enjoyed every minute of her company. She has an unbelievably genuine passion for all animals and wildlife, it’s been a pleasure getting to know you. Their absolute commitment and dedication to ensure Raekie was well looked after and transported as safely as possible, was so inspirational to me. They worked tirelessly that weekend, without any complaint. We are only as good as the people we surround ourselves with. Thank you.